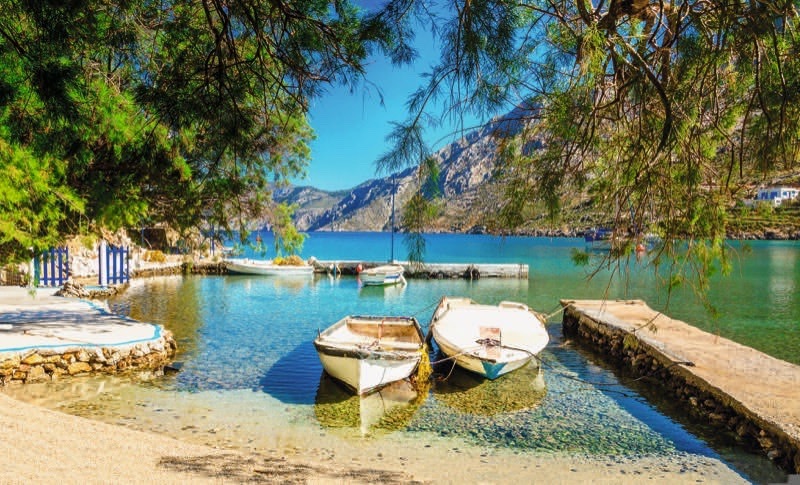 As the largest and most southerly of the Greek islands, Crete is blessed with stretches of picturesque olive groves, vineyards, wild flowers and mountain views, surrounded by dreamy beaches lapped with sparkling blue waters. Over the years the island has been home to many civilisations and conquerors, all of whom have left their mark, with a trail of Venetian fortresses, Ottoman mosques, Byzantine monasteries, ancient bustling towns and important archaeological sites. It is also the setting for many well known Greek myths featuring incredible stories of passion, revenge, love, loss and labyrinths. Also dating back to ancient times is the Greek concept of ‘xenia’ – the art of showing courtesy and generosity to travellers, which you will find still lives on in abundance today. Making this just the place then to venture into the great outdoors, soak up some ancient culture and enjoy a little of that legendary Greek hospitality. 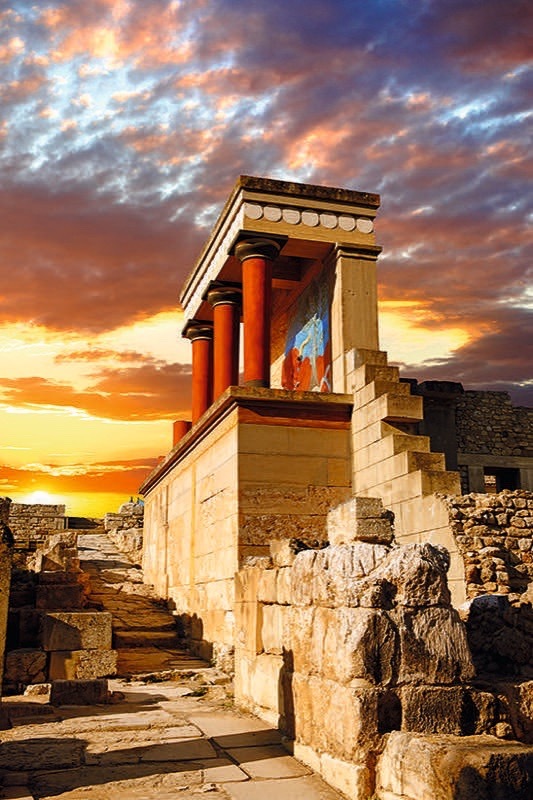 The Palace of Knossos was home, over 4,000 years ago, to the mysterious Minoan people, who are said to be the founding fathers of advanced European civilization. The palace was excavated and partially reconstructed in the early 1900s by British archaeologist Sir Arthur Evans, who dedicated his life to uncovering the site. In Greek mythology, this is also the real-life place where Theseus chased and killed King Minos’s son, the (half man, half bull) Minotaur, in the labyrinth beneath the palace, and where Icarus (son of palace architect Daedalus) flew too close to the sun, melting the wax in his makeshift wings, dropped into the sea and drowned. Experts are still baffled by the Minoan civilisation, which seemed to appear from nowhere in 2,600 BC and disappear again 1,200 years later. A tour of the site, largest of four Minoan palaces on Crete, gives you an idea of how surprisingly sophisticated they were: under-floor heating, ventilation shafts, running water and… a flushing toilet! Today, as then, the site is patrolled by beady-eyed wild peacocks, lending an enigmatically regal air to this captivating place. Many of the artefacts discovered at Knossos are now on display in the capital’s Archaeological Museum. Recently restored and reopened, with 27 rooms of finds covering 5,500 years from Neolithic to Roman times, the museum is world renowned for its Minoan collection. Marvel at the famous Prince of the Lilies and Dolphin frescoes, giant still-intact clay jars (pithoi), and the intriguing, as-yet, undeciphered Phaestos Disc. A short boat ride from Plaka or Elounda takes you to Spinalonga and gives a fascinating insight into life as a banished leper half a century ago. 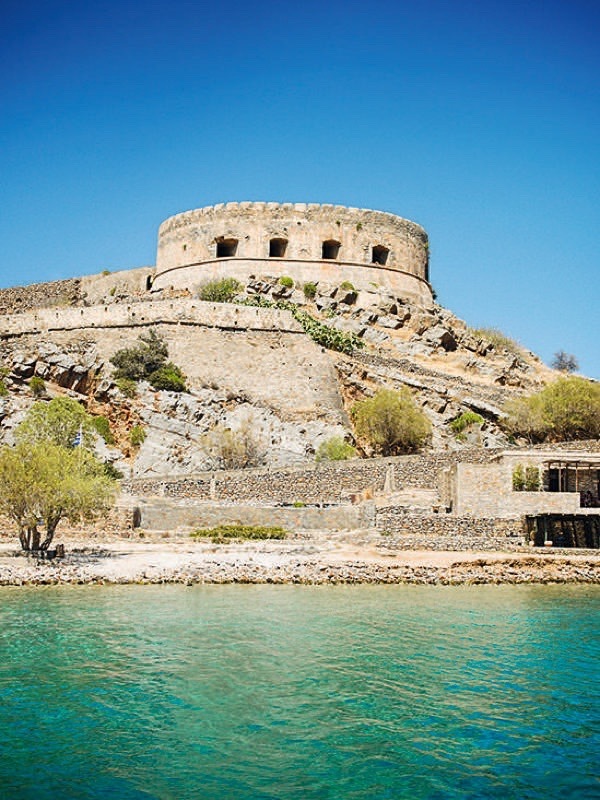 Since Victoria Hislop’s hugely popular debut novel ‘The Island’, Spinalonga now receives around 4,000 visitors per day. Life on the island was initially pretty bleak but, following the intervention of a law student exiled to the island himself in 1930, living conditions greatly improved, and the inhabitants were able to start living life – some even getting married and having children. Following medical advances, the last leper left the island (grudgingly) in 1957 but you can wander the long-abandoned homes, churches, tavernas and coffee shops that once made up life in this apparently peaceable, thriving community. According to legend, Dionysus, god of wine and festivity, was married to Ariadne, daughter of Crete’s King Minos. With such high-ranking connections, you’d expect the wine here to be pretty special – and it is. Varieties of grapes used are indigenous to the island, and, along with the soil, plentiful sunshine and low rainfall all work together to create the perfect environment for high quality and unique, distinctive flavours. Some of Crete’s wineries also produce the island’s famed extra virgin olive oil. Take a tour of the Stilianou Winery, where the passionate head of this family business will explain the history and processes of its organic wine and olive oil-making. Afterwards, enjoy tastings of the velvety Theon Gi (Land of the Gods) Red, crisp Theon Dora (Gift from the Gods) White and a delicious sweet dessert wine, Kotsifali. 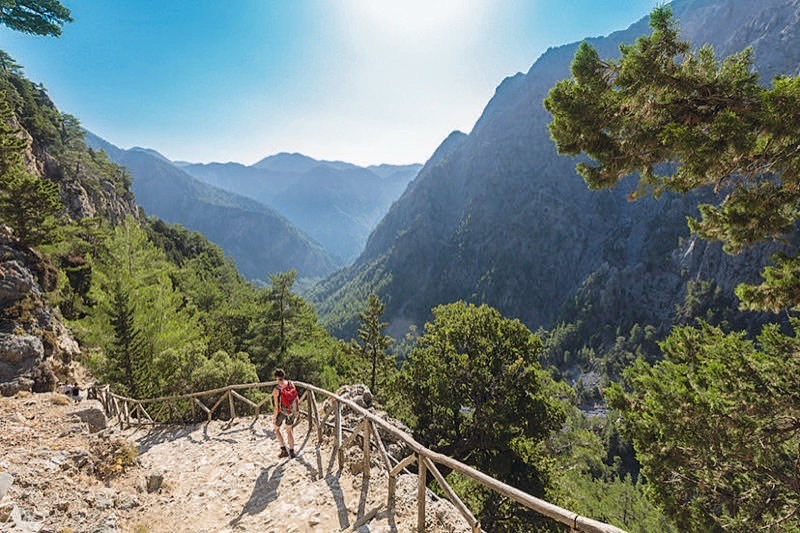 Samaria Gorge, in the south-west of the island, is a stony 10 mile (5 to 7 hour) trail of spectacular natural beauty and is considered a must for keen hikers. Along the way, keep your eyes peeled for peonies, rockroses, cyclamen, anemones, orchids, and the endemic Cretan ebony. If you’re lucky you may spot a kri-kri, the island’s endangered, elusive wild goat. From various towns along the northern coast you can join boat cruises offering sightseeing, dolphin-spotting and fishing. But if it’s in the water you’d rather be, then this is the place to swim, snorkel, scuba dive, jet-ski, windsurf and kitesurf to your heart’s content. It’s very heartening to realise that in the last 4,000 or so years on Crete, some things haven’t changed all that much. Clay jars from 2,600 BC once contained olive oil and wine, just as the tanks and barrels of the island’s modern wineries do. Decorations on Minoan pottery depict marine life, fish and octopuses. Grapes used in wine making today are from the same vines unearthed at Knossos. And all these things are still the mainstay of the Cretan diet today – olive oil-rich salads, plates of fresh, locally-caught fish, grilled octopus, smooth red wines and zesty whites. It’s said that Cretans never eat the same food two days running, so make sure you follow this philosophy and try everything. 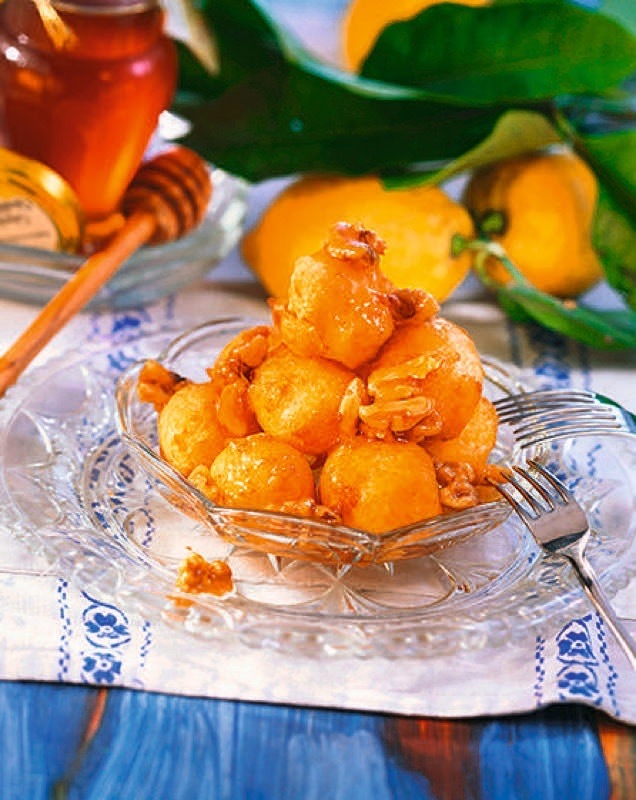 Don’t miss the cheese pies, fresh fish platters, smoked pork and, while baklava is the famous Greek dessert, search out Crete’s loukoumades – little balls of deep-fried pastry dripping in honey. Heaven! Finish with a shot of raki, also known as Cretan brandy. Sometimes flavoured with lemon, rosewater or honey, this fiery digestif is often given at the end of a restaurant meal as a ‘thank you’ for your custom. With spectacular views of the Mirabello Gulf, this stylish five-star hotel offers a choice of elegant rooms, bungalows and maisonettes, some with infinity pools. It has five restaurants, various sports and entertainment facilities, swimming pools, spa and sauna, private beach and beach bar. 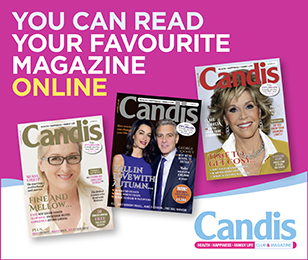 All-inclusive packages from £526 per person. 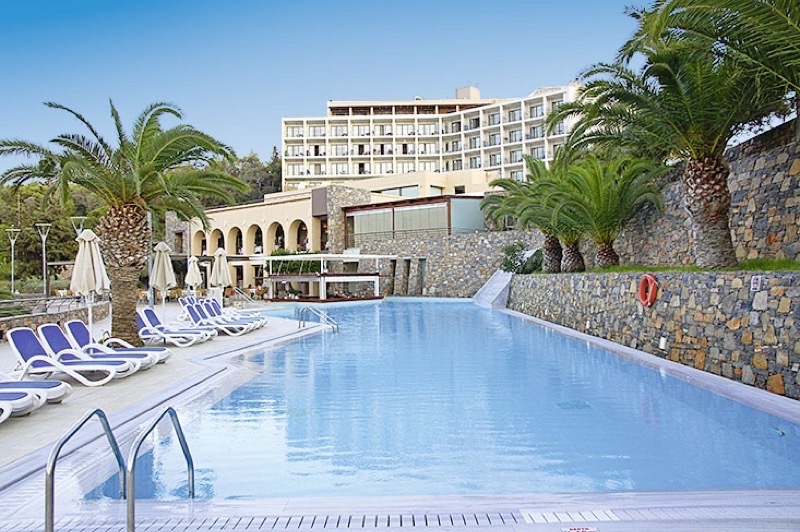 Prices include return flights from airports across the UK and seven nights’ all-inclusive accommodation. Book online at onthebeach.co.uk or call 0871 474 3000* Calls charged at national rate plus network extras. My husband needs accessible room, walk in shower not over the bath, ground floor accommodation if no lift. Are these available please? Hi Margaret, thanks for your comment. This is something which would need to be specified when booking with the travel provider. We won’t have details on specific rooms which are available unfortunately. Many thanks, Rachel. I’m looking for four night away in Greece from 25th August 18, are there any flights available for this time period please.